Welcome to Bradford, an industrial city on the edge of the moors of the Britain's West Yorkshire Pennines and in the heart of Bronte Country - where the Bronte sisters were born and lived and wrote their classic novels. Founded sometime around the time of the Norman Conquest, the original village of Bradford sprang up around the "Broad Ford" crossing Bradford Beck at church bank, by the site of Bradford Cathedral on the edge of what is now known as Little Germany. [The stream now passes through underground tunnels on its way to meet the River Aire near Shipley en route to Leeds and beyond.] However, it was not until the industrial revolution, in the late eighteenth and nineteenth century that Bradford grew and gained importance as a major producer of textiles and became known as the woollen centre of the world. To support the textiles mills and machinery a large manufacturing base grew up in the city, leading to diversification with different industries thriving side by side. Today most of the older textile mills and some of the heavier industries have closed, but Bradford remains one of the north's important cities, with modern engineering, chemicals, digital media, I.T. and financial services (especially building societies) replacing the "dark satanic mills" of the industrial revolution. Owing to its heritage as an international trading centre, Bradford boasts some fine Victorian buildings, including City Hall, the Wool Exchange (now converted in to a bookstore and cafe), Manningham Mills, and the nearby industrial village of Saltaire (now a UNESCO designated world heritage site) as well as a fine Victorian cemetery at Undercliffe. 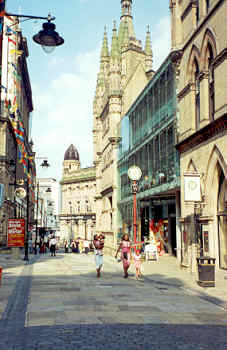 More recent developments include Sunbridge Wells and the new Broadway, as well as the Kirkgate and Oastler shopping centres. 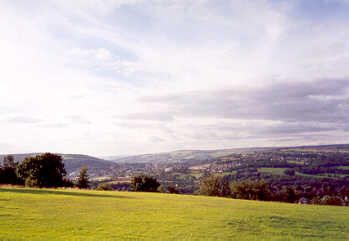 Despite its industrial past, the city of Bradford is situated near to the very edge of the West Yorkshire conurbation, with the wide open spaces of Baildon Moor and Rombalds Moor (just above Shipley, Saltaire, Baildon, Bingley and Keighley respectively) lying very close by, the wild Pennine moors of Haworth and the heart of Bronte Country lying immediately to the west, and the stunningly beautiful Yorkshire Dales (designated as one of England and Wales' national parks) beginning only about fifteen miles away to the approximate north west. Closer nearby (and actually still within the Metropolitan District) is the very pleasant spa town of Ilkley (famous for Yorkshire's county anthem "On Ilkla Moor Baht'at" and also the Ilkley Literature Festival), Otley (famous as the birthplace of Thomas Chippendale), Bingley and nearby Cottingley (well known for its association with the bizarre story of the Cottingley Fairies) and the village of Esholt, (which was formerly used in the filming of Yorkshire TV's popular soap opera, "Emmerdale"). The city is well connected with the outside world, having a short motorway (the M606) linking it to the M62 trans-Pennine route, and having no less than two main railway stations at Forster Square and Bradford Interchange in the city centre (the latter also containing an integrated and recently refurbished bus station). Leeds Bradford International Airport is close nearby at Yeadon, serving internal flights as well as well as scheduled and charter flights to mainland Europe and beyond. Bradford itself is famous as the birthplace of the composer Delius, the author and playwright J.B. Priestley, the novelist John Braine (one of the 1950s "angry young men", and author of "Room at the Top"), the astrophysicist and cosmologist Sir Fred Hoyle (who was born in the outlying village of Gilstead and who spent his early years in Bingley) the artist David Hockney (whose works are included in the 1853 Gallery in Saltaire, and (of course) the Bronte sisters, (who were born at what is now known as the Bronte Birthplace in the village of Thornton - now a suburb of the city to the west) before moving on to live at Haworth (where they grew up and wrote their classic novels - including "Wuthering Heights" and "Jane Eyre"). 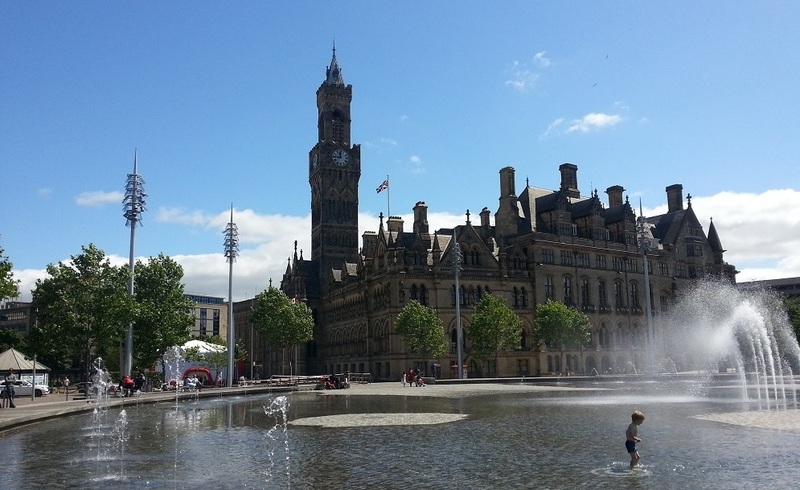 Having such a fine cultural heritage the city attracts attention at the international level, and in 2015 paid host to the first Bradford Literature Festival (which it is hoped will become an annual event). Bradford is also famous as the location of the UK's National Science and Media Museum, the Peace Museum, an Industrial Museum, and the Alhambra Theatre. Educational establishments in the city include the University of Bradford and Bradford College, with notable schools in the area including Bradford Grammar School, Bingley Grammar School, St. Bede's and Woodhouse Grove (where Charlotte Bronte taught for a while). In sport, the city of Bradford has historically been represented by Bradford City F.C. (which usually plays at the local Valley Parade stadium), Bradford Park Avenue Football Club and the famous Bradford Bulls rugby club, who play at Odsal Stadium. Bradford is also well known for its ethnic diversity and its numerous and nationally renowned curry houses - where some of the country's finest Anglo-Asian cuisine can be savoured in a variety of establishments ranging from small cafes and take-aways to large restaurants (please see the eating out in Bradford section for further details). The city is also home to the World Curry Festival and the Bradford Mela. Other regular events held in and around the city include the Bradford Festival, the Bradford Science Festival, the Bradford Classic car rally and the Saltaire Festival in Saltaire. With its rich industrial heritage, diverse cultural background and stunning scenery close by the city of Bradford has formed the backdrop for countless movie and TV productions, and in 2009 was awarded the prestigious title of UNESCO City of Film. Please click here for information about guides and tours in the Bradford area. Please click here for links to other Bradford related websites.